A high-energy, fully-fortified pelleted grain concentrate for all classes of meat and dairy goats. Grain products, plant protein products, processed grain by-products, forage products, roughage products, molasses products, ammonium chloride, calcium carbonate, magnesium sulfate, potassium sulfate, zinc sulfate, zinc methionine complex, copper sulfate, manganese sulfate, ethylenediamine dihydriodide, cobalt carbonate, sodium selenite, vitamin A supplement, vitamin D3 supplement, vitamin E supplement, yeast culture. Formax Pro Goat 16 Pellet – RUM should be fed to growing goats as the sole ration. For hand-feeding, ensure that adequate trough space is provided for all goats to eat at once. 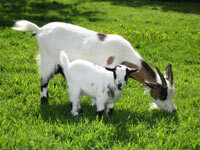 Provide Burkmann Goat Mineral from Burkmann Feeds and clean fresh water at all times. CAUTION: Do not allow horses or other equines access to feeds containing Monensin. Ingestion of Monensin by horses has been fatal. Feeding undiluted or mixing errors resulting in high concentrations of Monensin has been fatal in cattle and could be fatal in goats. 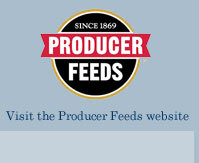 Monensin medicated feed is intended for use in cattle and goats. Consumption by unapproved species may result in toxic reaction. DO NOT feed to lactating goats.